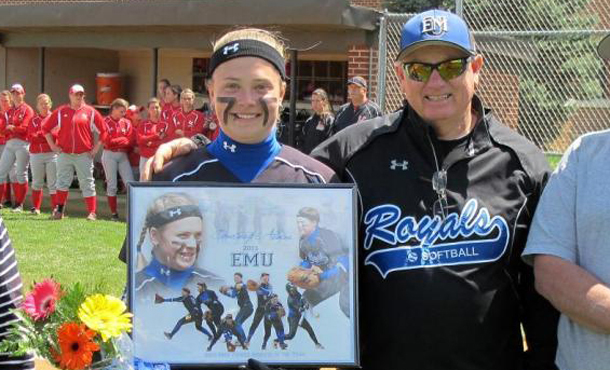 EMU’s offense and defense came together on Senior Day, as the Lady Royals swept No. 16 Lynchburg College. The women close the regular season on a five-game winning streak and will open play as the No. 8 seed in the ODAC Tournament on Friday against top-seeded Virginia Wesleyan. The last time Eastern Mennonite entered the ODAC tourney as the No. 8 seed, they won four straight games and claimed the 2010 ODAC Championship. As in previous years, all games at the ODAC Tournament will be at the Moyer Complex in Salem, VA.
Click here for the official interactive ODAC bracket. Before Sunday’s doubleheader with Lynchburg, senior Courtney Allman (Mt. Solon, VA/Fort Defiance) was honored on Senior Day, and retiring Athletic Events Coordinator Phil Guengerich threw out the first pitch at the final home event of the year. The Lady Royals took advantage of a handful of Hornet mistakes in their first at-bat, scoring five unearned runs to take the lead. Allman fittingly started the scoring with an RBI single, and freshman Aislinn Lucas (Grottoes, VA/Fort Defiance) sent a towering three-run bomb over the left field fence to make it 5-0. The Hornets responded quickly with four, two-out runs in the second. EMU struck again in the fifth, with Allman rapping another RBI single before Molly Smith (Elkton, VA/Spotswood) shot a three-run homer to make it 9-4. LC got a solo homerun to lead off the sixth, but Smith retired the next six batters she faced to lock up the win. Allman finished 2-3 with two RBIs and two runs. Smith and Lucas each hit their fourth longball of the season. Lead-off batter Brooke Sigrist (Crimora, VA/Fort Defiance), who transferred from Lynchburg to EMU this year, had a pair of singles. Smith picked up the win to improve to 6-3. She allowed just one hit with five strikeouts in 4.2 innings of relief. Eastern Mennonite scored in the first inning again in the nightcap, and then got a solo shot from Jordan Aylor (Madison, VA/Madison County) in the second to take a 3-0 advantage. The Hornets cut the lead to one with two runs in the fourth, but the Allman helped rebuild the cushion in the fifth. She launched her eighth homerun of the year, and 31st of her career, over the left field fence, as EMU plated four more runs for the final 7-2 margin. Kaitlyn Morris (Elkton, VA/Page County), another LC transfer this year, went the distance from the circle, scattering eight hits to improve to 4-9. Allman finished 1-2 with three RBIs, hitting a homerun in her final at-bat on Gehman Field. Smith was a perfect 3-3 from the plate with an RBI. Brooke Hensley (Elkton, VA/Spotswood) was 2-3 with a walk, scoring two times. The Lady Royals close the regular season 21-17 overall and 9-11 in the ODAC. They tied with Randolph College for seventh, but settled for the No. 8 seed based on losing the head-to-head tie-breaker with the WildCats. EMU was swept by top-seeded Virginia Wesleyan during the regular season, losing 4-0 and 8-1 in Virginia Beach on Apr. 13.